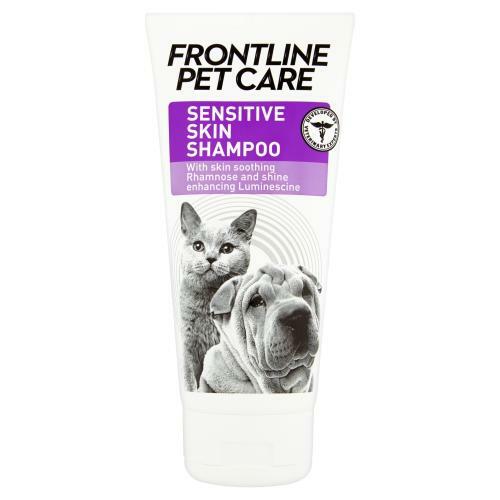 Frontline Pet Care Sensitive Skin Dog & Cat Shampoo has been developed by veterinary experts for dogs and cats with sensitive, dry or irritated skin. Contains Rhamnose, a polysaccharide compound that inhibits bacterial adhesion to the skin and coat, reduces odours and has a soothing effect, while Luminescine, a natural plant extract, helps deflect harmful UV rays and enhances colour and radiance for a brilliant natural shine. Contains Rhamnose-based polysaccharide to soothe and hydrate the skin. Contains Luminescine an antioxidant protecting against harsh sunlight and restoring shine to the coat. 1) Put your pet at ease by calmly stroking them. Ensure the water temperature is comfortable. Apply shampoo on wet hair. Lather for 5–8 minutes. Rinse well. 2) Have several towels ready to replace each one as it becomes wet. Place the towel on your pet’s back and gently rub the coat dry. Then move to the stomach, chest and paws.